As I mentioned in my last post, I spent much of the summer working on my dissertation, so I don't have a lot to share in the way of exciting activities or elaborate dishes, but we still enjoyed lots of summery meals and treats which I thought I'd share in a combined July and August monthly recap post! 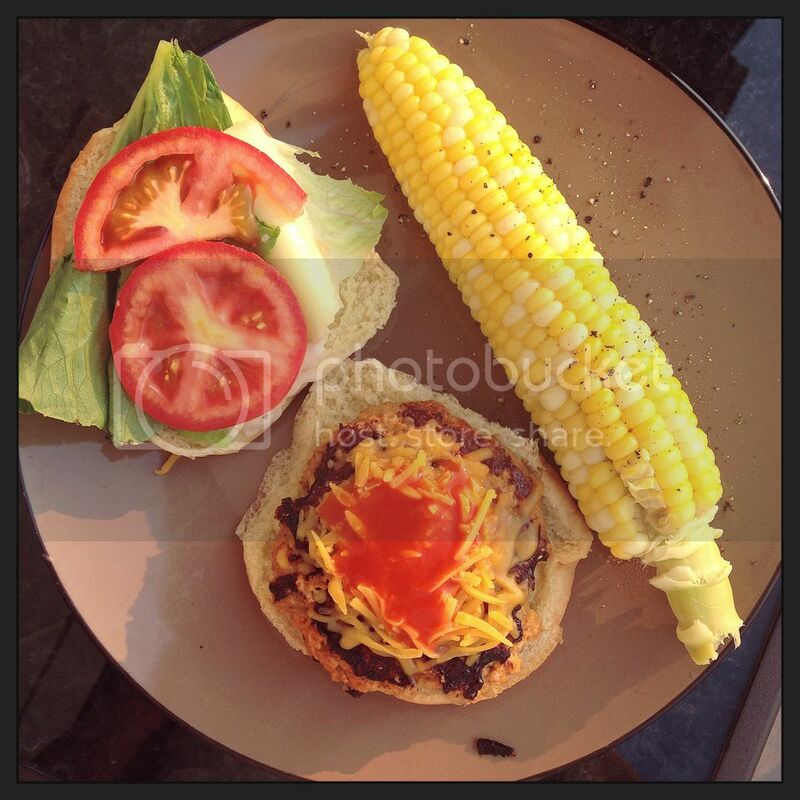 Meals like this were a staple this summer - fresh, local corn on the cob and burgers. Turkey burgers are one of the easiest meals for me to make and they're pretty healthy too. These are my favourite buffalo turkey burgers that we make all the time! Salads are also easy to make and let fresh summer produce shine through. 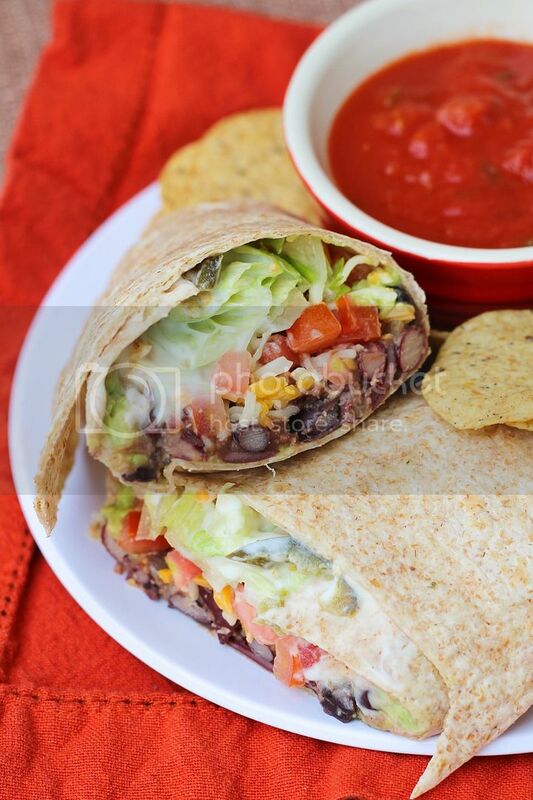 I love this combo of chicken, corn, tomatoes, cucumber, and feta cheese. 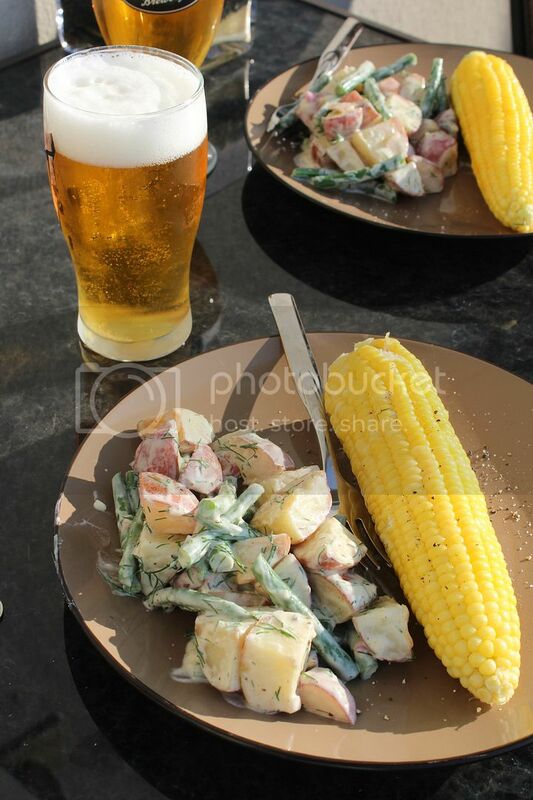 Here's another great summer meal, once again involving corn, with a variation on my warm dijon roasted asparagus and potato salad using dill instead of parsley and green beans instead of asparagus. 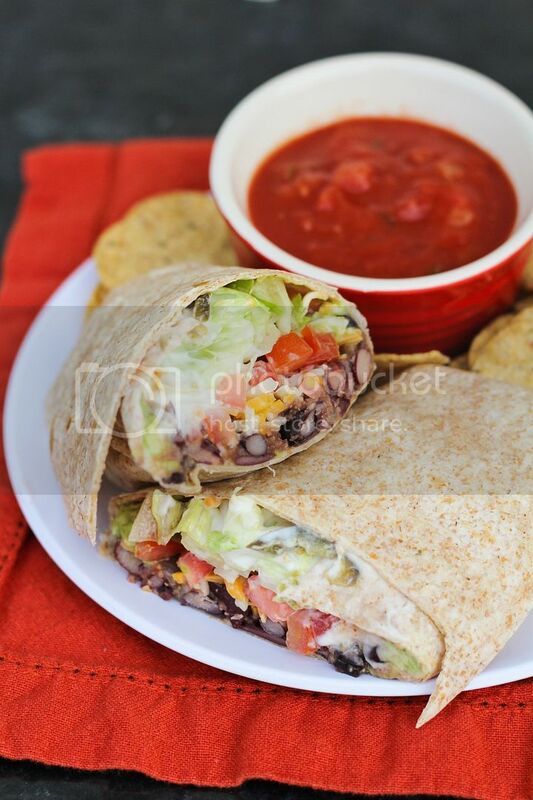 I love the mustard-yogurt dressing on this in place of mayo! 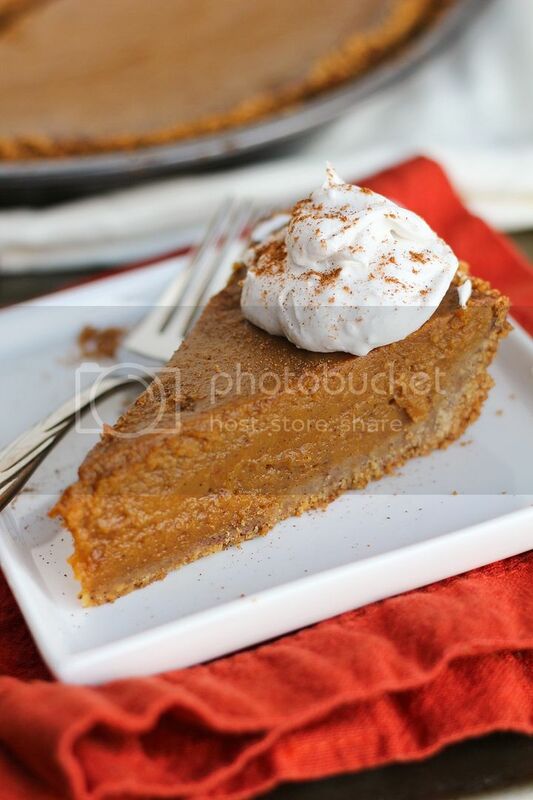 When I had time to cook I tried to make something that would give us a lot of leftovers (and thus days off cooking)! 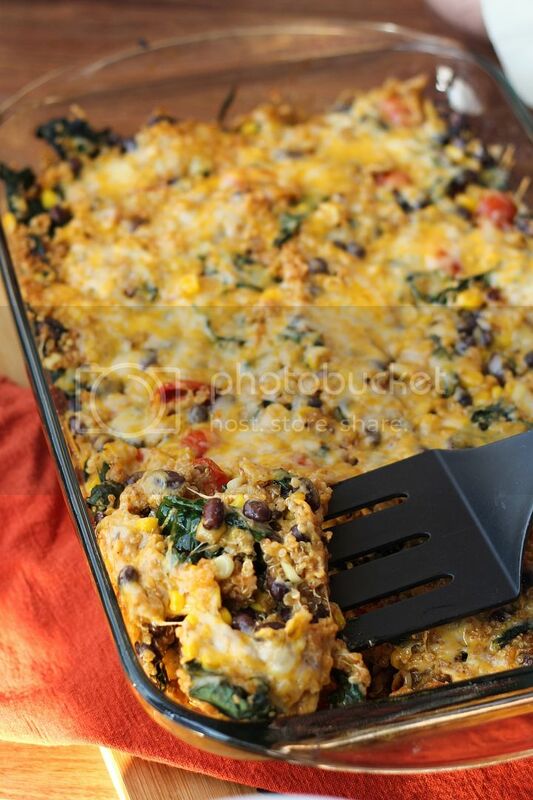 I loved this quinoa casserole I threw together with what we had in the fridge one night. I just cooked a box of quinoa in chicken broth then stirred in a little tomato paste, cumin, and chili powder. Then I sauteed some onion, garlic, corn, and kale in a separate pan, stirred in black beans, tomatoes, salsa, and more cumin and chili powder (and salt and pepper), stirred it all together with some shredded cheese, transferred it to a baking dish, topped with some more cheese, and baked in the oven for about 20 minutes (15 covered, 5 uncovered) at 375. 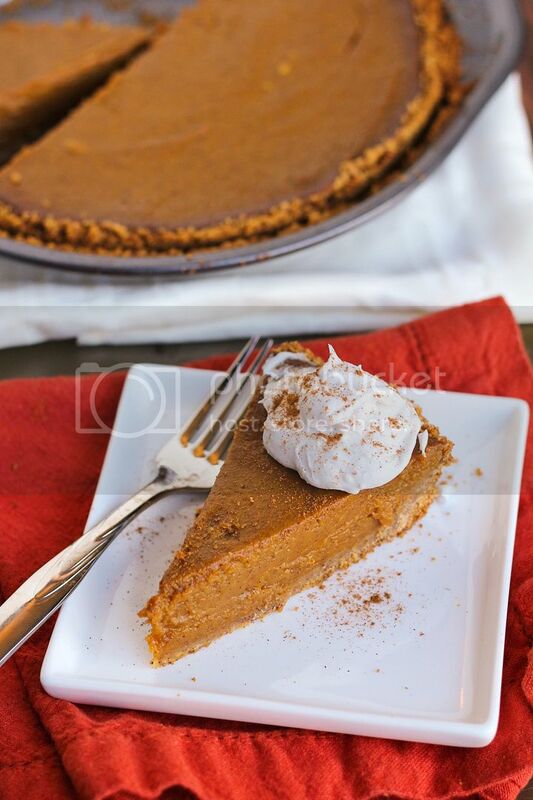 I plan on making something similar again soon so I can share it as an actual recipe! 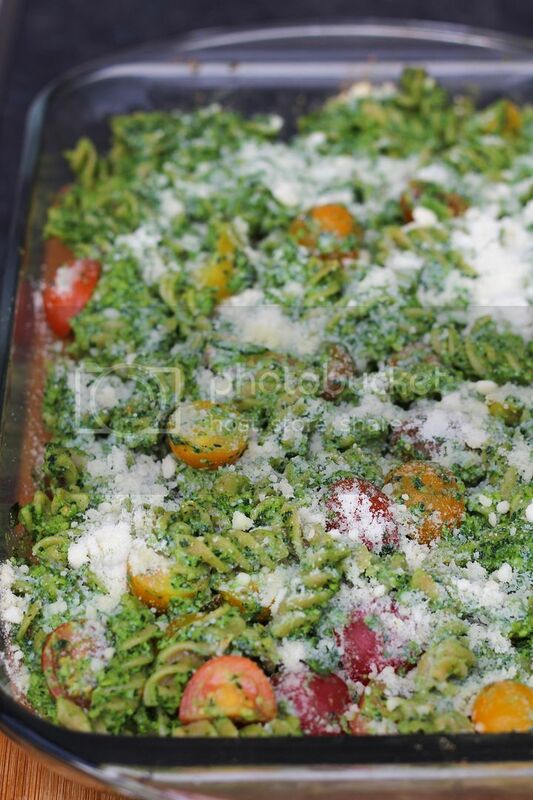 We also loved this baked pesto pasta from Pinch of Yum, which gave us lots of meals! The pesto was packed with spinach, kale, and basil, then tossed with whole wheat pesto, tomatoes, and a little cheese for a healthy and filling meal! 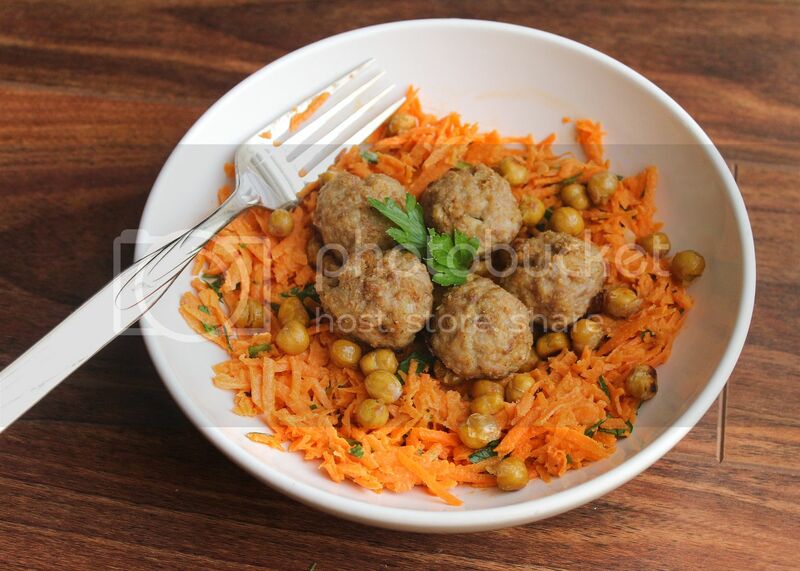 This carrot salad with a tahini dressing, crispy spiced chickpeas, and baked sesame turkey meatballs from Smells Like Home (click for the recipe) might sound a little weird but was one of my favourite new dishes I've tried recently. The flavours and textures all worked together so well and I loved that it was a balanced and healthy meal. I plan on making it again soon! 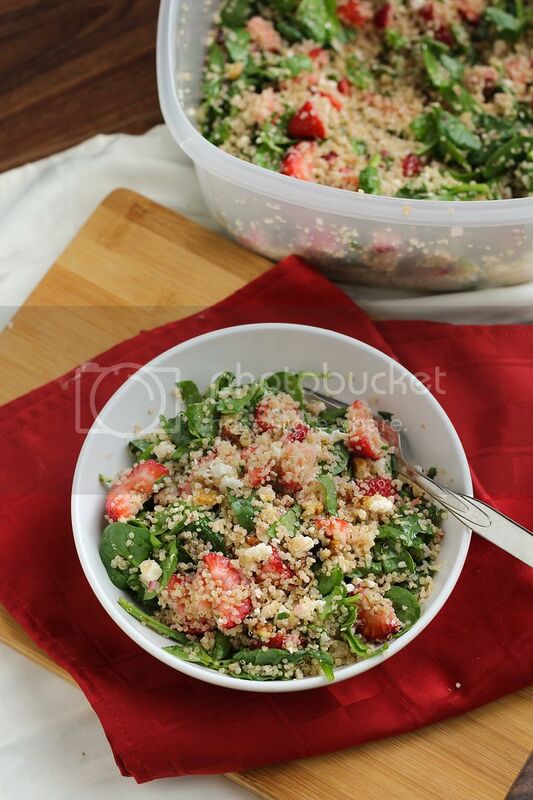 I made this quinoa salad with strawberries, spinach, feta, and pecans for a strawberry social potluck my lab held earlier this summer. 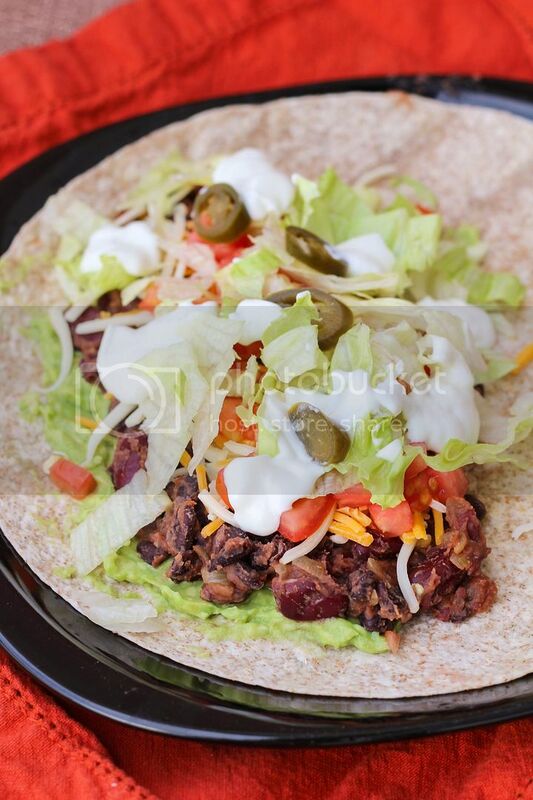 It was light and tasty but I thought it needed a bit more flavour so I didn't share the recipe on here. I'll have to try again next summer; too bad strawberry season is so short! When my whole family started to come down with colds in August, I made a big batch of vegetarian pho to try to fight it off. I haven't tried a traditional pho before, mostly because I'm not a fan of the meat that comes in it, so it was hard to compare this version but I didn't think it tasted quite right (though we did manage to fight off our colds!). 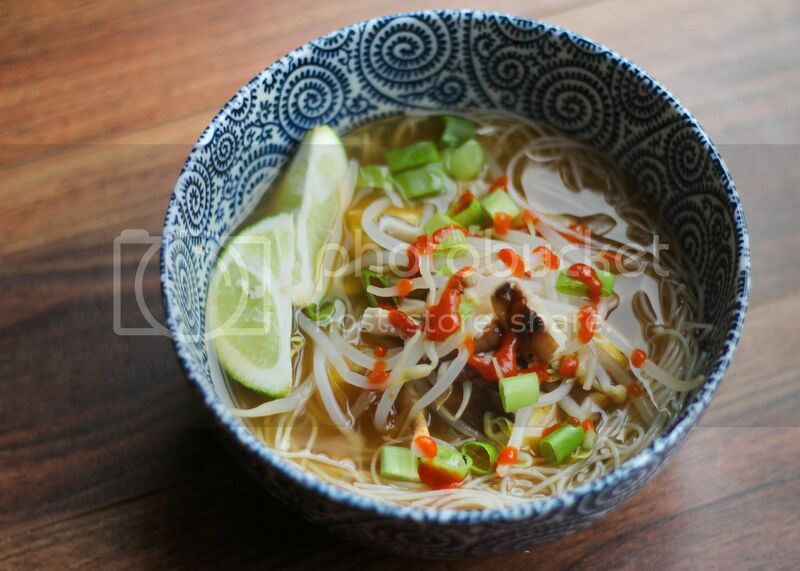 If anyone has a great vegetarian pho recipe, please share! Naan pizzas are one of my go-to quick and easy light meals when I don't have time to cook. 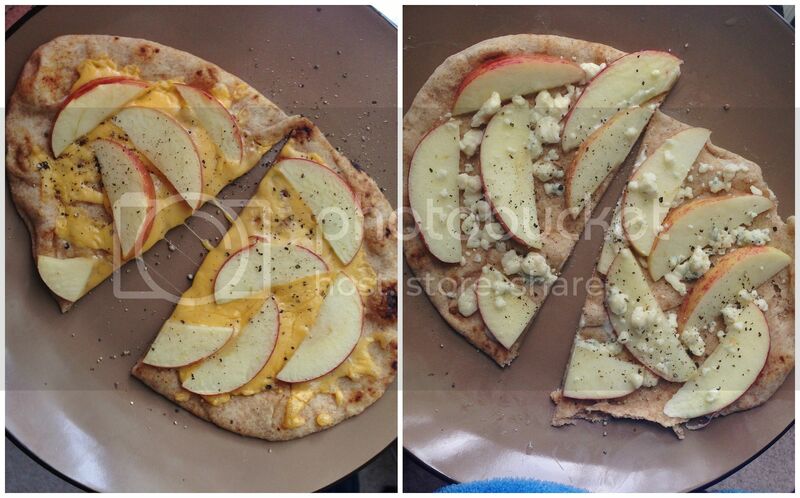 I love the combo of apples and cheese! I also ate a lot of sandwiches. 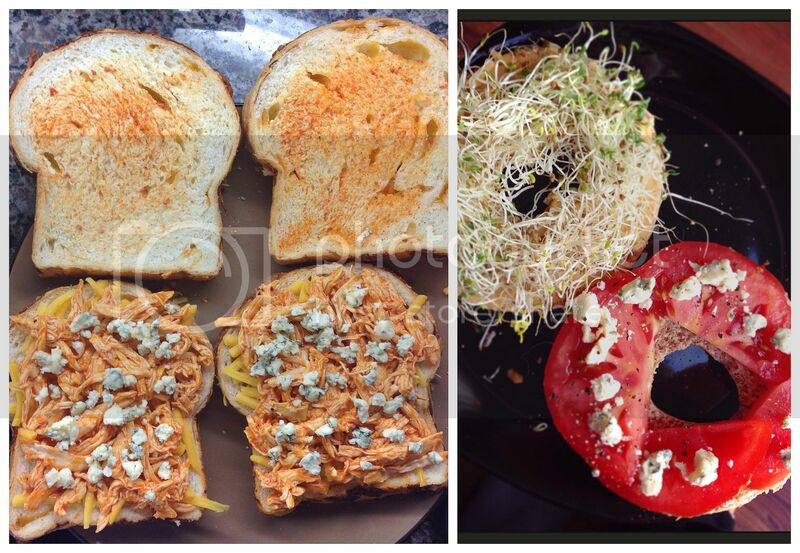 Pictured on the left above is a buffalo chicken and blue cheese grilled cheese, and on the right is a whole wheat bagel sandwich with hummus, sprouts, tomatoes, and a little blue cheese. Both so good! 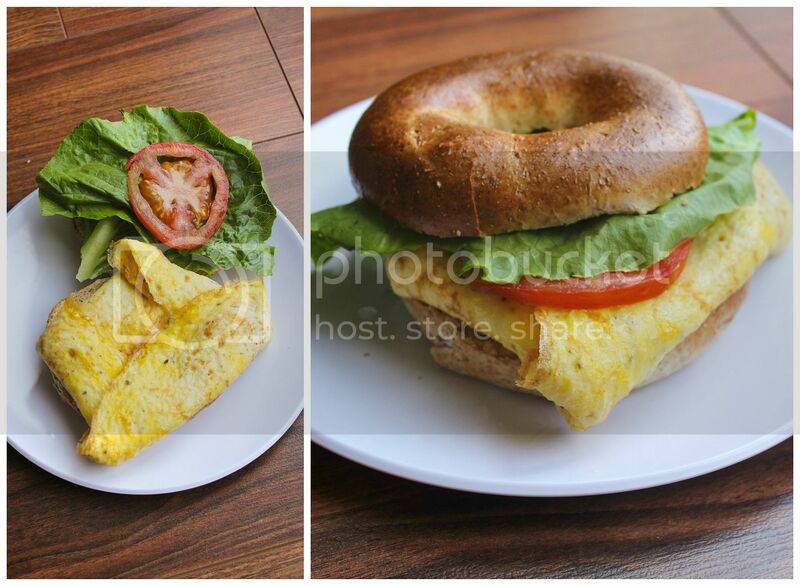 And a breakfast version of a bagel sandwich - I follow this method for making a little omelette and cheese egg that fits perfectly on a sandwich with a little lettuce and tomato! 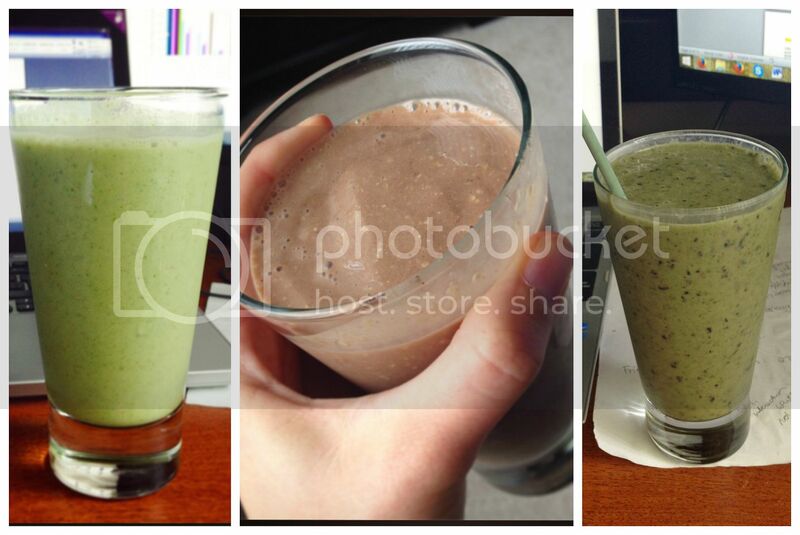 When I was working from home I drank lots of smoothies to power me through! I always start with a frozen banana, oats, and almond milk, then I'll throw in some combination of powdered peanut butter, cocoa powder, raw honey, spinach, or berries. I also love adding instant coffee for a little pick me up! 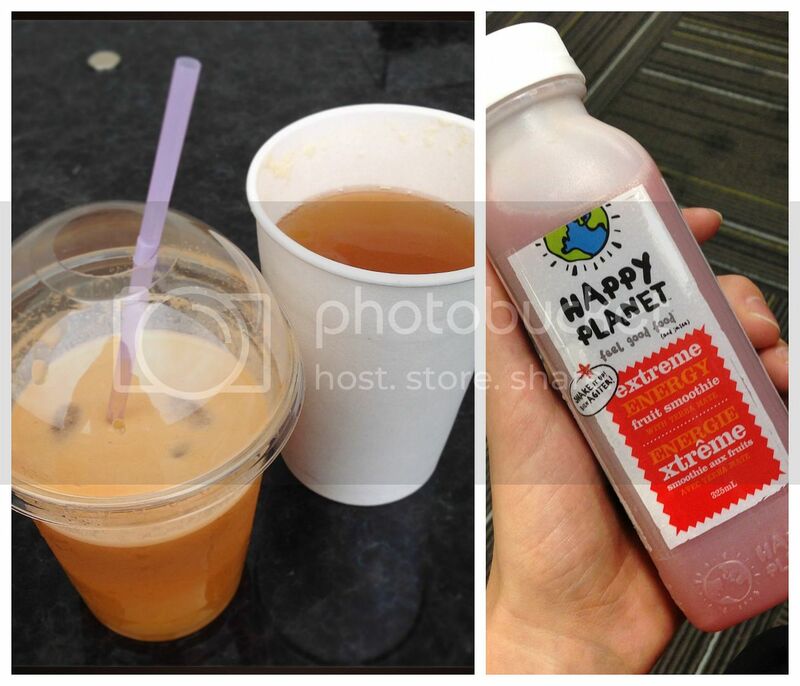 Fresh fruit juices (pictured is a beet, carrot, and cucumber juice), kombucha drinks, and fruit smoothies also gave me writing energy! 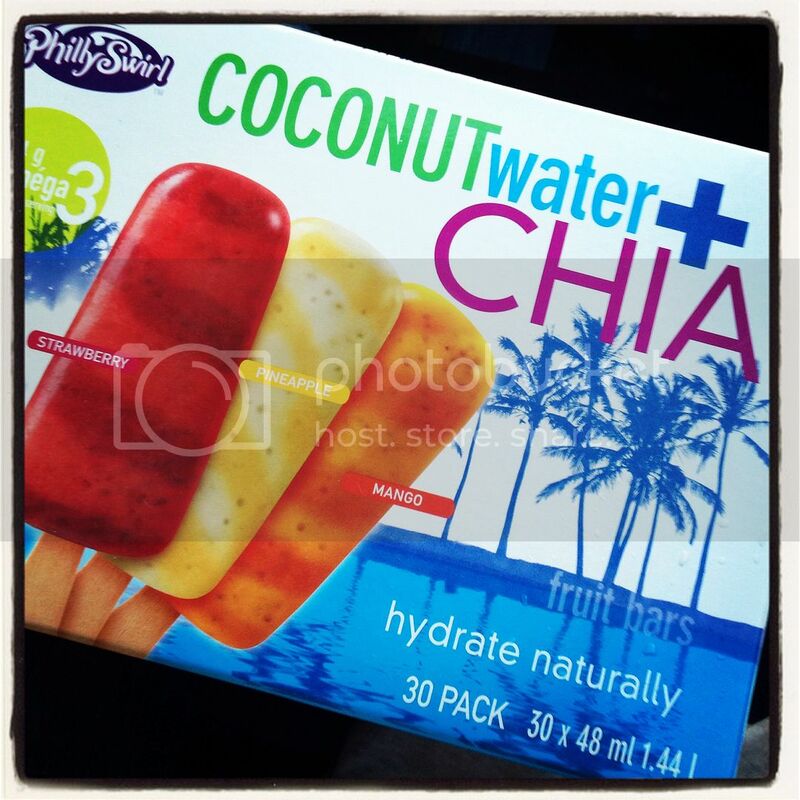 These coconut water and chia popsicles I got at Costco were a great refreshing snack! 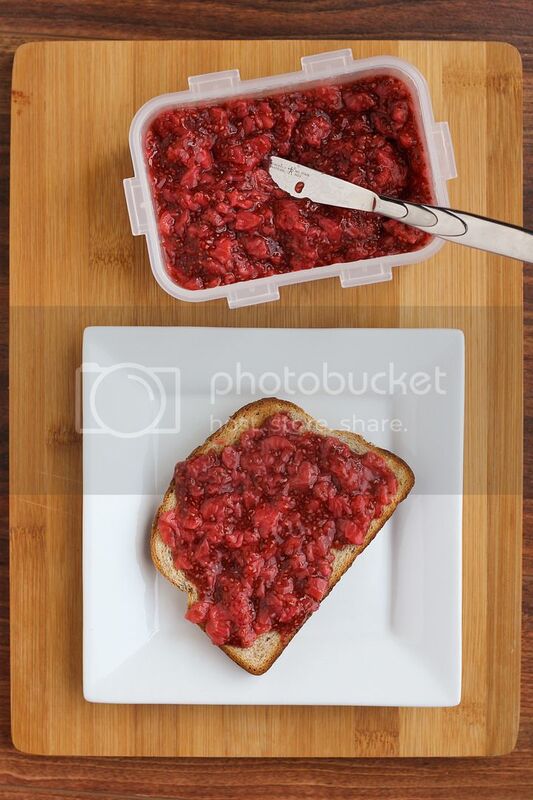 I love chia seed jam because it uses so much less sugar than traditional jam and adds in the nutritional benefits of chia seeds. I only made one batch this year (using local strawberries, some raw honey, and chia seeds) but wish I'd made more! 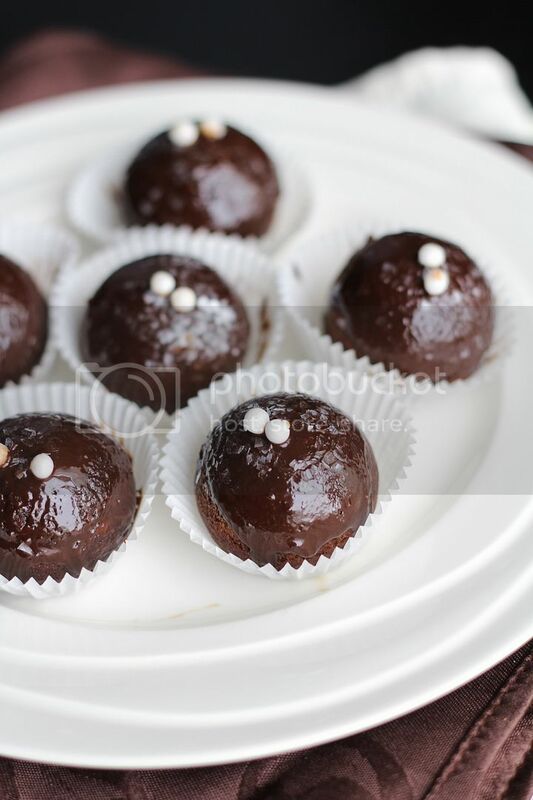 I finally used my babycakes cake pop maker to make some chocolate guinness cake balls using a recipe from their cookbook. No cake mix or canned frosting or having to roll the two together and put them on a stick like I've done with cake pops in the past - I loved these! 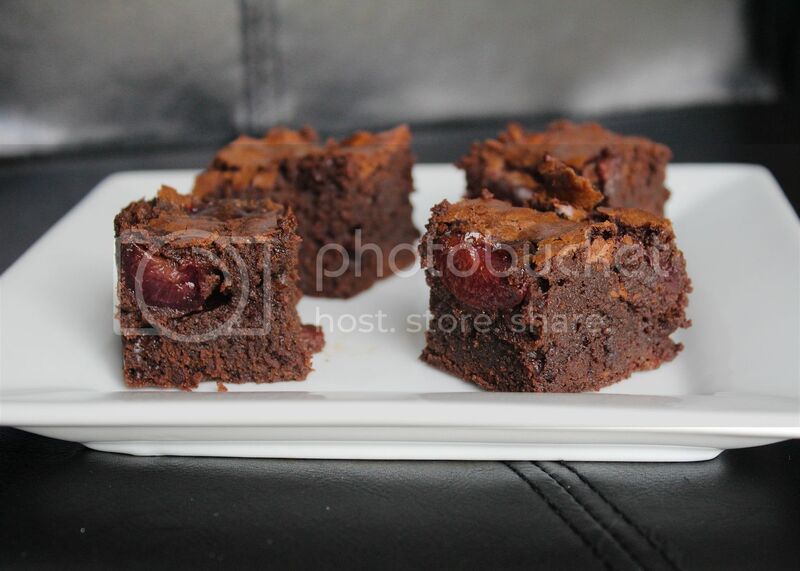 I've made these roasted cherry brownies in the past and made them again for an event this summer. They're rich, dense, and chocolatey but with bursts of sweet roasted cherries to balance them out. 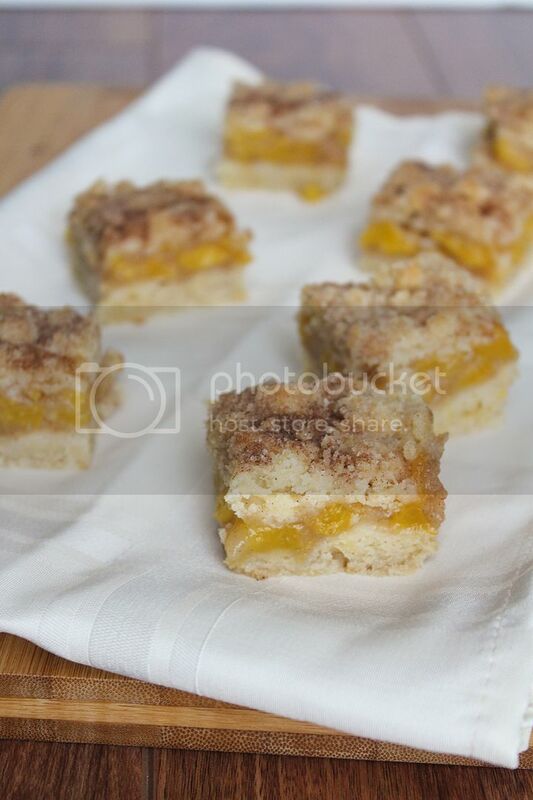 I tried these peach crumb bars from Two Peas & Their Pod for the first time and they were delicious (though I'd call them cake squares rather than bars). It's probably a little late in the year to be recommending them now but you should save this recipe to try for next peach season! 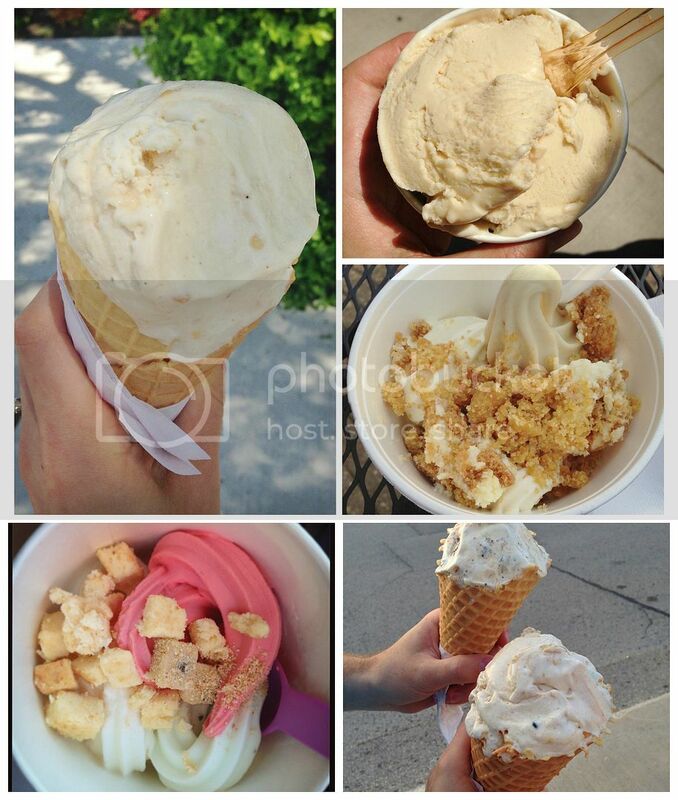 I also treated myself to lots of ice cream/frozen yogurt breaks! 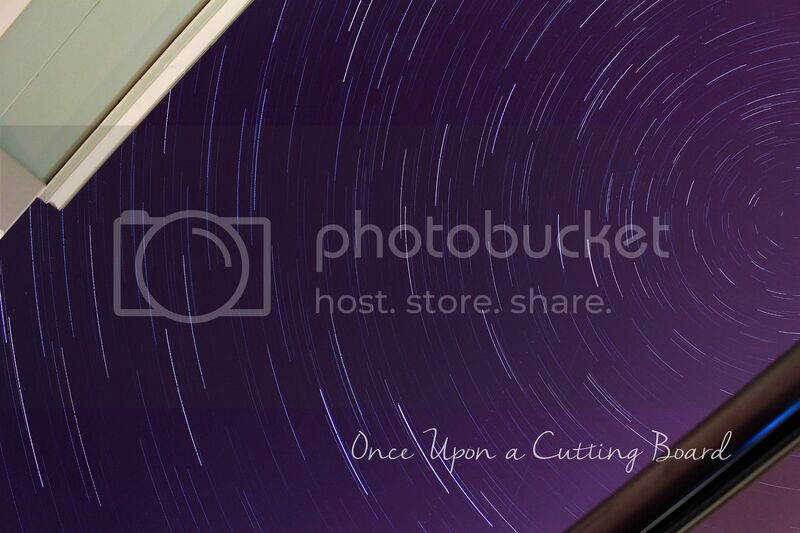 I tried star trail photography for the first time one summer night and loved how it turned out. It takes a few hours to get one picture though so I didn't get another chance to try it but look forward to doing it again next summer! Looking back on all this food makes me wish for summer weather and food to come back and stay a little longer, but I'm also excited to start working with fall ingredients now! 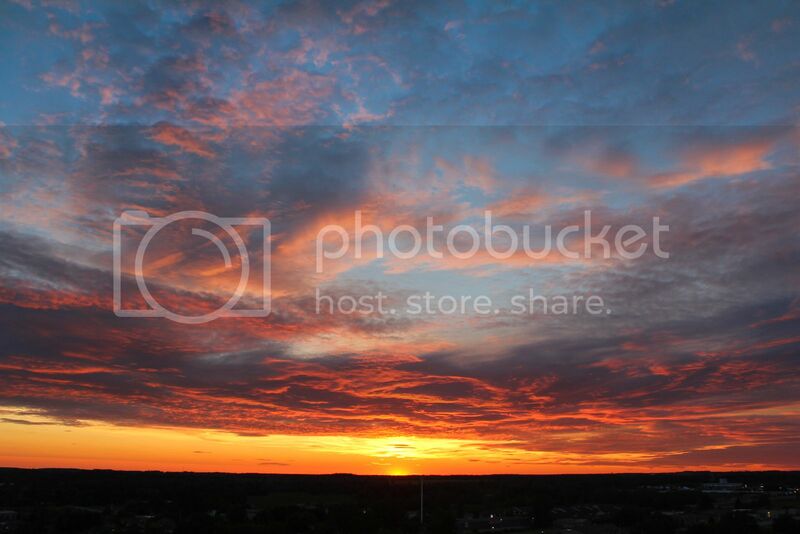 Hope everyone had a great summer! 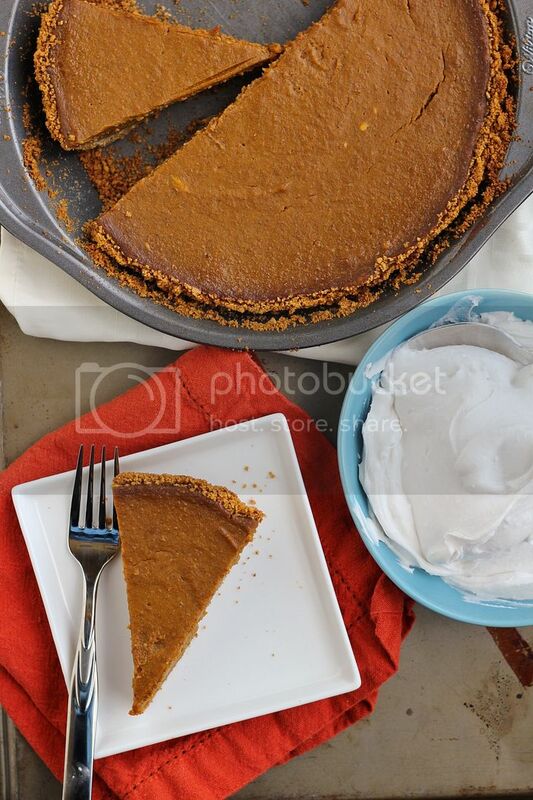 I didn't intend to take such a long absence from this blog, but my summer ended up being entirely taken over by working on my PhD dissertation, and I didn't have time to even go outside many days let alone create and photograph recipes or write blog posts. Now that I've handed it in (one step down!) I'm hoping to have a little more time for blogging! 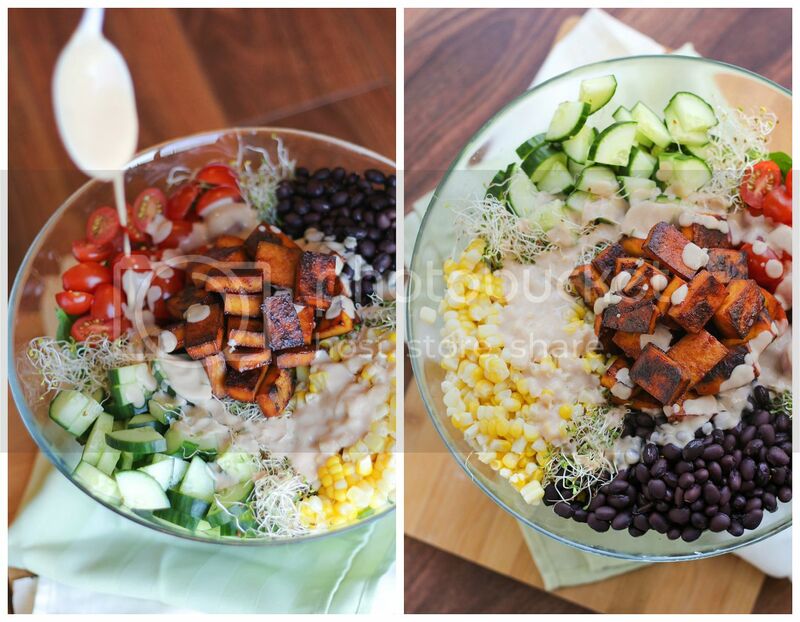 Needless to say, most of my meals this summer consisted of quick and easy dishes, which included a lot of salads! 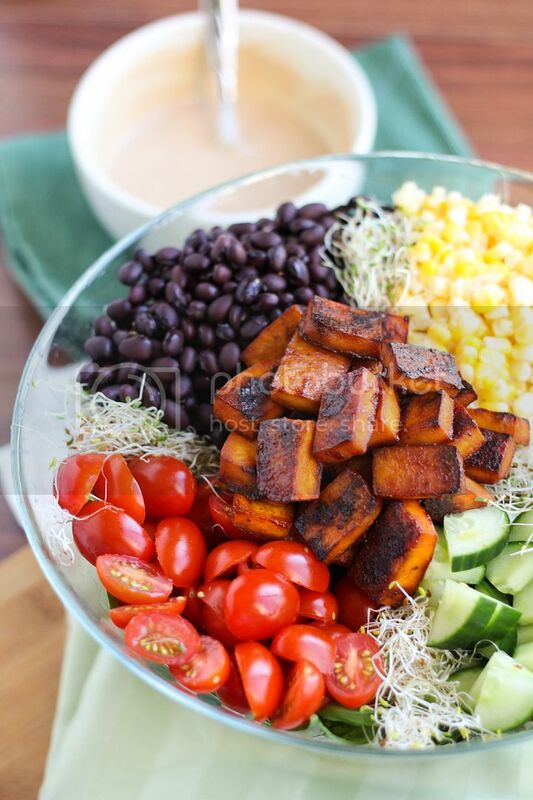 This bbq tofu salad was a little more time consuming because of the steps involved in preparing the tofu (pressing the water out, marinating it, and baking it), but it's worth it! I follow Oh My Veggies' recipe for baked barbecue tofu which is my favourite way to eat tofu. She calls it 'tofu for tofu haters' and I agree; I used to think I hated tofu until I tried it this way, so if you think you hate it too, give this a chance! 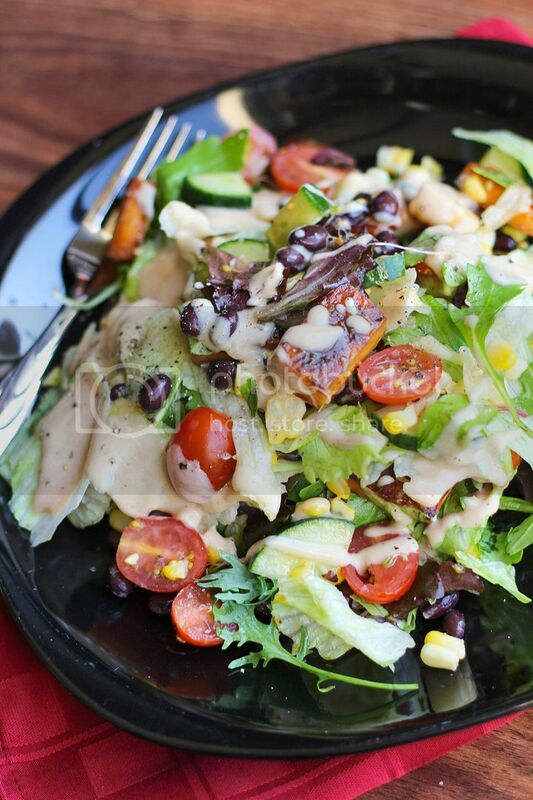 With the addition of fresh corn, tomatoes, cucumber, black beans, two types of lettuce, and sprouts, this salad has lots of crunch, flavour, and protein. 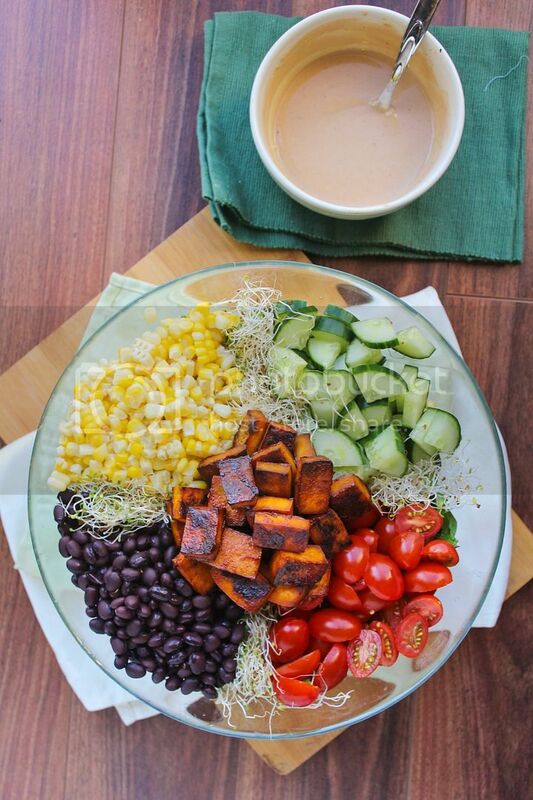 For the dressing, I whisked together some low-fat plain yogurt with a bit of bbq sauce, apple cider vinegar, and a couple spices for an easy, creamy, and light dressing that complemented the tofu. And as with most salads, feel free to add in whatever else you like! 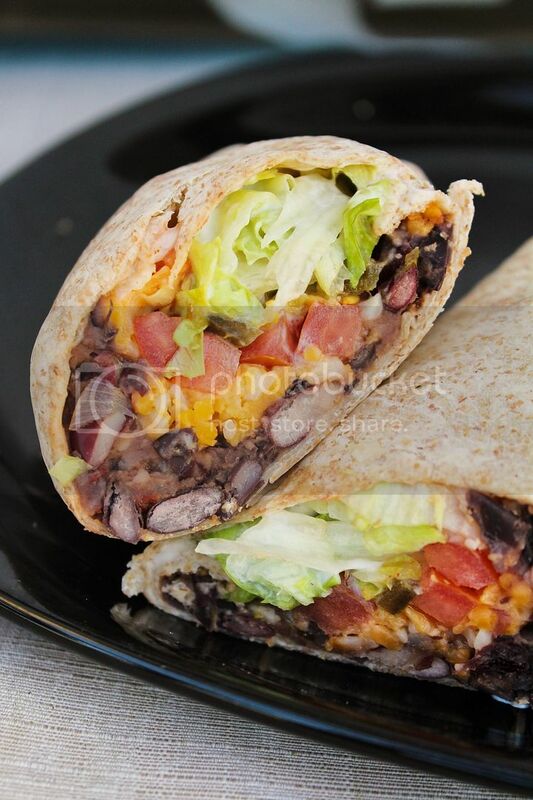 Avocado would have been great, I just couldn't find any ripe ones in time; mushrooms would work well too. I'm hoping to share some of the other easy meals I was enjoying over the summer in a recap post later this week, then I can't believe it's already time to start thinking about fall recipes (which I admit I'm pretty excited about)! Prepare baked barbecue tofu following directions from Oh My Veggies (be sure to allow enough time to press the tofu, marinate it, and bake it). If using fresh corn, cook according to your liking if desired (I boil the cobs of corn in a large pot of boiling water for about 5 minutes, rinse with cold water, then slice off the kernels). Prepare other salad ingredients. Whisk all ingredients for the dressing together in a small bowl, taste, and adjust any amounts to your liking. 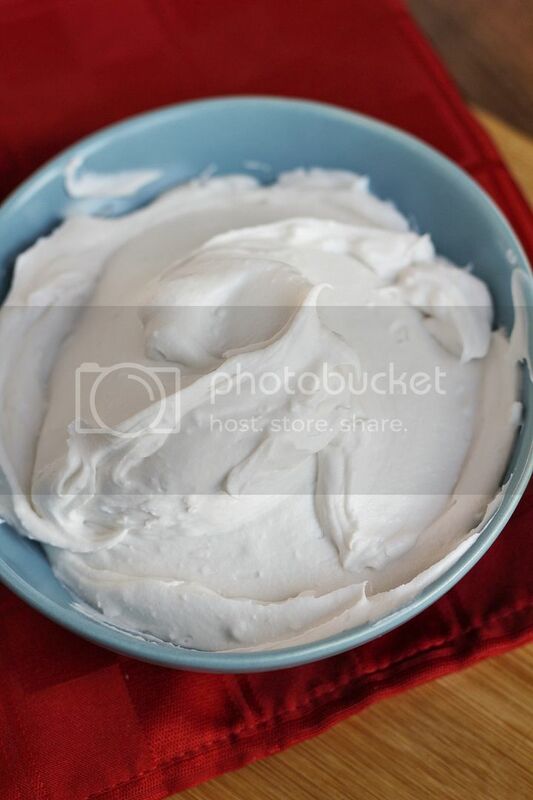 I sometimes add more yogurt or throw some mustard in. 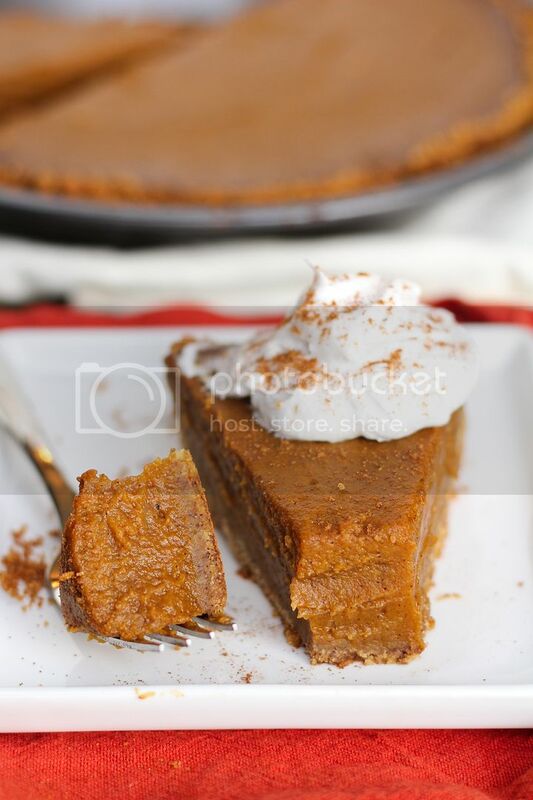 You can add a bit of water to thin it out if necessary. 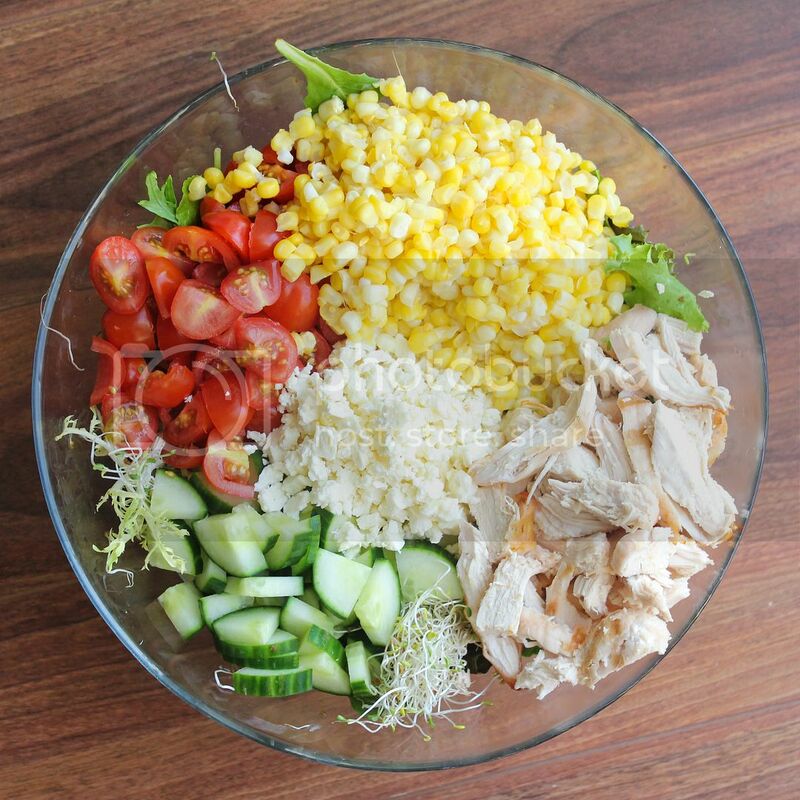 Toss together all ingredients with the dressing and serve.